The Wirehaired Vizsla is a most unique and exciting new breed. Developed in the mid 1930's, the Wirehair, or UPLANDER as they were known when first introduced in the United States in 1970, were developed by breeding the smooth coat Vizsla and the solid colored German Wirehaired Pointer. Hunters obtained permission from the Kennel Club to develop this breed because they wanted a dog that would hunt like a Vizsla, but could withstand the cold temperatures and cold water. In Hungary, the breed was first shown in 1943, and fully recognized by the European FCI in 1966. They were imported to Canada and the US in the 1970's, and recognized by the Canadian Kennel Club in 1977. The Wirehaired Vizsla is shown at conformation shows in all of Europe and in Canada, but not yet fully recognized by the American Kennel Club, although they are now a part of the AKC's Foundation Stock Service. WV's are currently registered in the US by NAVDHA, ARBA, UKC, IABCA, and now with The American Kennel Club where as of July 2, 2014, they were fully recognized and able to be shown in the regular AKC Championship classes. There are currently almost 600 AKC registered WV's in the US. We have established the Wirehaired Vizsla Club of America, recognized as the AKC parent club, to encourage responsible ownership, passion for this extraordinary breed, and support the full recognition by the American Kennel Club. cannot be registered with any registry or kennel club in the world. that their dogs are registered with the American Kennel Club - FSS. The Vizsla, smooth or wirehaired, is an intelligent dog, which gets along well with children, and enjoys being indoors or outdoors so they are ideally suited to the country dwelling family or the city life. They do have an inbuilt desire to protect their family with which they are very affectionate and loyal. They should be socialized from an early age. 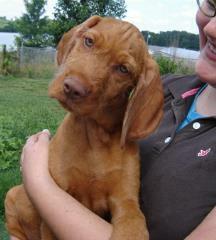 In general both Vizsla breeds like to stay with the family and will not wander off too far from the home. They will happily be both a family and working dog in one. 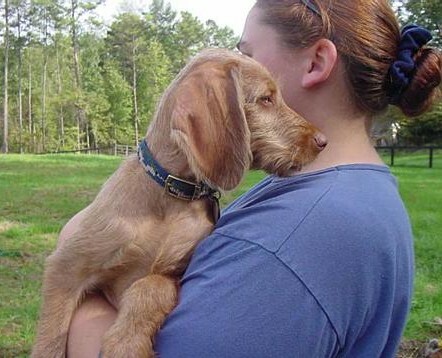 Wirehaired Vizslas are an accomplished gun dog, excelling in upland game birds, and waterfowl. They are a no-nonsense field dog, while loving the family life. A true couch potato, WV's are usually of a bit softer temperament than their smooth cousins. Close ranging in the field and in the neighborhood, they are easily worked from a distance, and easily trained. The coat of a WV is a wiry topcoat with a water repellant undercoat. The wire coat of a correct length does not matt, but looks it's best when at least brushed, but especially when stripped, either by hand or by a stripping knife. When stripped, the coat will be encouraged to grow back with a wirey texture, thicker and more dense. Occasionally there is what looks like a smooth coated puppy born in a wire bred litter. These make wonderful maintenance free hunting dogs or companions! Originating in Hungary, the Wirehaired Vizsla was developed by hunters and falconers who desired a sturdy, versatile hunting dog able to withstand harsh winters in the field, forest and water. The Wirehaired Vizsla is a distinguished, versatile hunting dog of medium size, bred for substance and a dense wire coat. Balanced in size and proportion, the Wirehaired Vizsla is robust and lean. Movement is powerful yet graceful with far reaching drive enabling the breed to hunt in all elements and cover any terrain encountered by the walking hunter. The breed possesses an excellent nose for hunting and tracking feather and fur on land and in water, as well as a natural point and retrieve. The breed’s most distinguishing features are its weather resistant dense wire coat and its facial furnishings, specifically its beard and eyebrows. Natural appearance is essential to breed type, therefore the Wirehaired Vizsla is to be shown with limited stripping and should not be penalized for being shown in working condition: sinewy, well muscled, with honorable scars. The Wirehaired Vizsla is intelligent, loyal, sensitive and biddable, but will not tolerate harsh handling. Eager to learn, lively yet gentle, they are readily trainable for gun and falcon. The Wirehaired Vizsla is a tractable and affectionate companion in the home. The Wirehaired Vizsla is a medium sized hunting dog, however overall symmetry and balance are more important than mere measurable size. The ideal male is 23 to 25 inches at the highest point over the shoulder blades. The ideal female is 21.5 to 23 inches. Because the Wirehaired Vizsla is meant to be a medium-sized hunter, any dog measuring more than 1 inch over or under these limits must be disqualified. The body length from breastbone to buttocks slightly exceeds the height at the shoulders, as ten is to nine. The Wirehaired Vizsla body is well muscled and strong, with sufficient bone and substance. The Wirehaired Vizsla’s head is in proportion to the body, moderate and well muscled. The expression should be lively, clever, and is enhanced by the eyebrows and beard. Eyes are slightly oval, of medium size with well fitting eyelids, giving the Wirehaired Vizsla an intelligent and lively expression. Iris color is as dark as possible and blends harmoniously with the coat color. Yellow eyes are a serious fault. Eye rim color should blend with the coat color, but freckles from sun or age are not to be faulted. Lower eye rims should neither turn in nor out. The ears lay close to the cheek with a rounded V shape. Ears are moderate in length and set fairly low, hanging close to the cheeks. The skull is well muscled, moderate in length, and slightly domed. A slight groove runs from the moderate occiput to the stop. The stop is moderate. The muzzle is slightly shorter than half the length of the head when viewed in profile. The muzzle is blunt, with a straight bridge that is parallel to the top of the skull and is well muscled with strong jaws. The nose is wide with nostrils well open. The nose color should blend with the coat color. Any black on the nose is a disqualification, but brown freckles, due to aging or sun exposure are not to be faulted. The bearded lips lay close to the jaw as tightly as possible. The jaw is strong with teeth aligned in a scissors bite. An over or undershot bite, or more than two missing teeth is a disqualification. The neck is in balance with the body and head, medium in length, muscular and slightly arched. Skin on the neck and body is tight fitting, there is no dewlap. The shoulders are strong and muscular. The topline is straight, well muscled and solid, falling into a slightly rounded, well muscled croup, which is moderate in length. The chest is deep, moderately broad, and well muscled. The depth of the chest is slightly less than half the height at the shoulders and sets at the elbow when seen from the side. The forechest is well developed. The ribs are moderately sprung and carried well back. The underline is graceful with a moderate tuck-up. The loin is tight, well muscled and straight or slightly arched. The tail is set just below the level of the croup. The tail is thick at its base then tapers and carries a dense coat. The preferred tail is docked by one-quarter of its length; natural tails will not be penalized. A natural tail reaches down to the hock joint and is carried straight or slightly saber-like. When moving, the tail is carried near the horizontal, not curled over the back or carried between the legs. The forequarters are well muscled with strong, sufficient bone and balance. From the front, legs are straight, from the side they are placed well under the body. Shoulders are well laid back, showing fluidity when moving. The upper arm is well muscled, about equal to the shoulder in length and well angulated at it’s attachment to the shoulder, in order to allow for good extension. The elbows lay close to the body; pasterns are short and sinewy and may be very slightly sloping. Preferably, dewclaws are removed from the front legs to avoid injury in the field, but a dog with natural dewclaws is not to be penalized. The feet are cat like, slightly oval and always parallel. Toes are strong and well arched. Pads are thick and tough; nails are self colored and short. The Wirehaired Vizsla’s coat makes this breed unique. Close lying with a length of 1-2 inches, the dense wiry coat should not hide the outline of the body. Functionally the coat should protect against weather and injury. The lower legs and underside of the chest and belly are covered with shorter, softer, thinner coat. Lacking coat brushes on the back of the front legs is faulty. Coat on the head and ears is close fitting and shorter. Pronounced eyebrows highlight the stop. Expression is enhanced not only by eyebrows, but also by a strong 1-2 inch, harsh beard formed from both sides of the muzzle. On both sides of the neck the coat forms V shaped brushes. A short smooth coat, or a soft woolly coat is less desirable and an excessively long coat is faulty. The Wirehaired Vizsla should be exhibited almost in his natural state, nothing more in the way of stripping being needed than a tidying up. A clipped coat is faulty. Golden rust in varying shades. Red, brown or yellow colors are faulty. The ears may be slightly darker than the body; otherwise the coat color is uniform. White on the forechest or throat, not more than 2 inches in diameter, as well as white on the toes is permissible and common. Solid white extending above the toes or white anywhere else on the dog except the forechest and throat is a disqualification. White due to aging or scars from hunting is not to be faulted. The Wirehaired Vizsla is self-colored, with the color of the eyes, eye-rims, lips, nose and toenails blending with the color of the coat. The Wirehaired Vizsla should move in a light-footed, smooth trot. When seen from the side, the gait is dynamic yet graceful and there is a balance to the movement with far reaching drive. The topline remains level, the back firm. When working in the field his sound movement enhances his ability as a versatile hunting dog. The Wirehaired Vizsla is self-confident, eager to learn, clever, sensitive and yet stubborn; affectionate and loyal with his owner, occasionally aloof with strangers and has a keen protective instinct. Shyness, nervousness or aggressiveness are faulty.